It’s looking as though the scales finally are tipping toward vehicle electrification. As the Frankfurt Motor Show gets underway this week, Volkswagen and Mercedes-Benz have announced that they soon will provide electric or hybrid internal combustion-electric versions of most of their models. Mercedes said it would start the changeover 2022, while VW set a 2030 deadline. Volvo kicked it all off and made big – and often misreported – news when it said in early July that it will be electrifying all new models starting in 2019. Electric I.D. 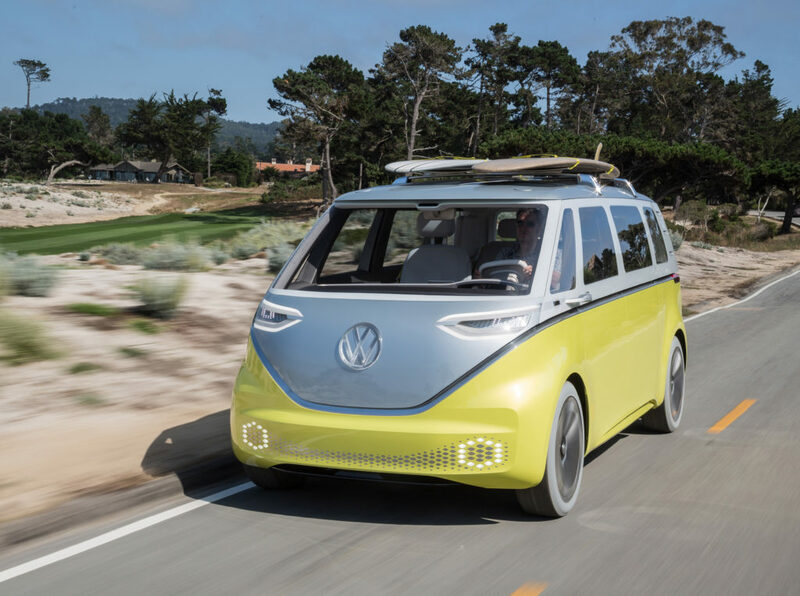 Buzz microbus concept foreshadows one of the 30 all-electric models VW plans to introduce. “Electrifying” doesn’t means turning every car and truck into an all-electric vehicle; it means adding some sort of electric drive or electric motor assist to a powertrain and can range from plugless and plug-in hybrids to full-on battery-electric and fuel-cell electric vehicles. In addition to Mercedes, Volvo and VW, Ford has said that its Lincoln division will have electrified variants of all of its models by 2022; Smart, a unit of Mercedes parent Daimler, has said it will go all-electric (no internal combustion models) by 2020, and Jaguar-Land Rover has said it will offer only electric or hybrid models with new cars it introduces starting in 2020. The big driver for all this vehicle electrification isn’t what’s going on in the U.S. – although California’s long history of pushing for alternatives to fossil fuel-powered vehicles certainly got the ball rolling and keeps the pressure on automakers to develop electrified (including fuel-cell electric) vehicles. Instead, it is the increasing regulation of vehicle emissions, noise and fuel consumption in Europe and Asia. China, the biggest auto market on the planet, really gave things a shove late last week when it announced that it was exploring a timetable for banning all fossil-fuel powered cars. That came after government officials in both France and the United Kingdom said they want to phase out fossil fuel cars and trucks. To that end, Uber said a few days ago to that it would ban diesel cars and vans from its London service and by 2020 would allow its roughly 40,000 drivers there to use only electric or hybrid cars. VW’s vehicle electrification announcement is a big one as it has so many brands and will now be bringing electric and hybrid power to all of them: Audi, Bentley, Bugatti, Lamborghini, Porsche, Seat, Skoda and VW chief among them. In all, the company said, it will offer 30 all-electric models and an unspecified number of hybrid and plug-in hybrid models spread throughout its holdings and across its global markets. Hyundai –Hyundai is developing a dedicated electric car platform for new line of all-electric vehicles and with its Kia stablemate will collectively offer 31 electrified models by 2020, including eight battery-electrics.